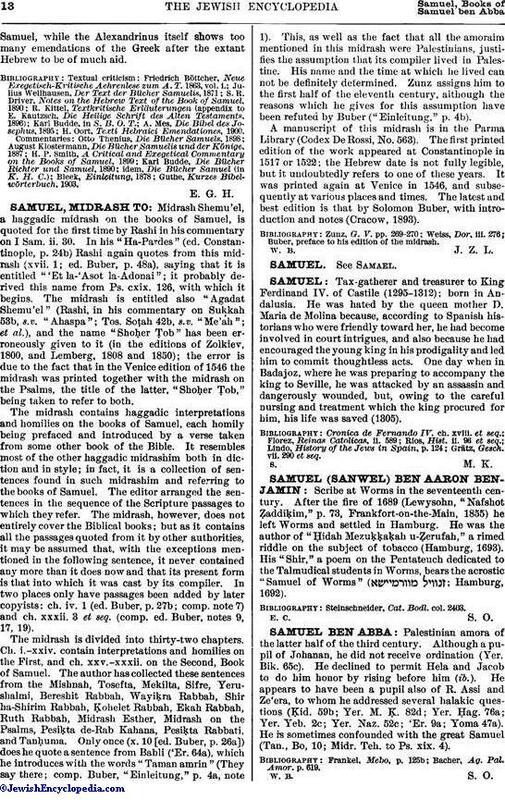 Midrash Shemu'el, a haggadic midrash on the books of Samuel, is quoted for the first time by Rashi in his commentary on I Sam. ii. 30. In his "Ha-Pardes" (ed. Constantinople, p. 24b) Rashi again quotes from this midrash (xvii. 1; ed. Buber, p. 48a), saying that it is entitled "'Et la-'Asot la-Adonai"; it probably derived this name from Ps. cxix. 126, with which it begins. The midrash is entitled also "Agadat Shemu'el (Rashi, in his commentary on Sukkah 53b, s.v. "Ahaspa"; Tos. Soṭah 42b, s.v. "Me'ah"; et al. ), and the name "Shoḥer Ṭob" has been erroneously given to it (in the editions of Zolkiev, 1800, and Lemberg, 1808 and 1850); the error is due to the fact that in the Venice edition of 1546 the midrash was printed together with the midrash on the Psalms, the title of the latter, "Shoḥer Ṭob," being taken to refer to both. The midrash contains haggadic interpretations and homilies on the books of Samuel, each homily being prefaced and introduced by a verse taken from some other book of the Bible. It resembles most of the other haggadic midrashim both in diction and in style; in fact, it is a collection of sentences found in such midrashim and referring to the books of Samuel. The editor arranged the sentences in the sequence of the Scripture passages to which they refer. The midrash, however, does not entirely cover the Biblical books; but as it contains all the passages quoted from it by other authorities, it may be assumed that, with the exceptions mentioned in the following sentence, it never contained any more than it does now and that its present form is that into which it was cast by its compiler. In two places only have passages been added by later copyists: ch. iv. 1 (ed. Buber, p. 27b; comp. note 7) and ch. xxxii. 3 et seq. (comp. ed. Buber, notes 9, 17, 19). The midrash is divided into thirty-two chapters. Ch. i.-xxiv. contain interpretations and homilies on the First, and ch. xxv.-xxxii. on the Second, Book of Samuel. The author has collected these sentences from the Mishnah, Tosefta, Mekilta, Sifre, Yerushalmi, Bereshit Rabbah, Wayiḳra Rabbah, Shir ha-Shirim Rabbah, Ḳohelet Rabbah, Ekah Rabbah, Ruth Rabbah, Midrash Esther, Midrash on the Psalms, Pesiḳta de-Rab Kahana, Pesiḳta Rabbati, and Tanḥuma. Only once (x. 10 [ed. Buber, p. 26a]) does he quote a sentence from Babli ('Er. 64a), which he introduces with the words "Taman amrin" (They say there; comp. Buber, "Einleitung," p. 4a, note 1). This, as well as the fact that all the amoraim mentioned in this midrash were Palestinians, justifies the assumption that its compiler lived in Palestine. His name and the time at which he lived can not be definitely determined. Zunz assigns him to the first half of the eleventh century, although the reasons which he gives for this assumption have been refuted by Buber ("Einleitung," p. 4b). A manuscript of this midrash is in the Parma Library (Codex De Rossi, No. 563). The first printed edition of the work appeared at Constantinople in 1517 or 1522; the Hebrew date is not fully legible, but it undoubtedly refers to one of these years. It was printed again at Venice in 1546, and subsequently at various places and times. The latest and best edition is that by Solomon Buber, with introduction and notes (Cracow, 1893). Buber, preface to his edition of the midrash.